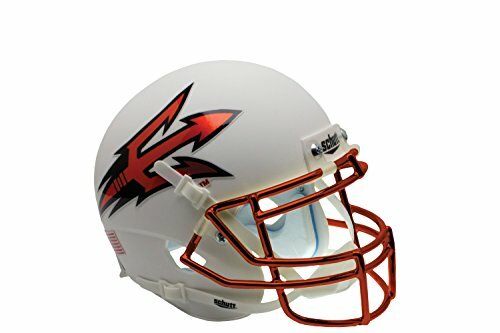 NCAA Arizona State Sun Devils Orange Authentic Helmet, One Size by Schutt at J State Tigers. MPN: 7050-045-10. Hurry! Limited time offer. Offer valid only while supplies last. The Schutt Authentic football helmet is a full size traditional standoff helmet that is the same helmet as your favorite team wears on the field. The Schutt Authentic football helmet is a full size traditional standoff helmet that is the same helmet as your favorite team wears on the field. Everything about this helmet is exactly as it is worn in a game. The faceguard is real metal, the interior of the helmet is TPU cushioning. This helmet comes complete with jaw pads and a chin strap.